This article shows how to configure the CMS for posting to Twitter. You first need to create a twitter app, and then configure the CMS to use the app to post articles' messages. Go to https://dev.twitter.com/apps and sign in with your Twitter user name and password. Click the Create a New Application button. Name - use your website name followed by the word Post. Website - Enter your website url. Accept the terms and complete the captcha field. After you click Create Application, you are taken a tabbed screen to enter the details, settings, and other configuarable items of your app. Scroll to the bottom of the Details tab to Your Access Token, and click the Create my access token button. In Application Type, select the Read, Write and Access direct messages access level. Click Update settings at bottom of screen. Open the OAuth tab. Use the settings in this tab to copy to the CMS Global Settings. 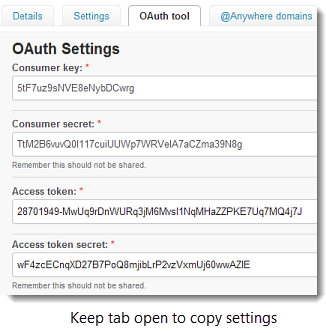 Keep the OAuth tab open and login to the CMS. Go to Website > Global Settings. Go to Article Module > Articles. Check an active article in the list. Click the Publish SM button on the top toolbar. Click Pubilsh to Social Media. Go your twitter account and confirm that the message appears. All URLs are altered by Twitter to be 20 characters. A URL may be shortened or lengthened to fit Twitter's constraints. Since the CMS sends a maximum of 120 text characters, the total characters in a tweet, including the altered URL, will not exceed the 140 character limit. If you have followed all above steps *exactly* and your twitter app is not posting your articles to Twitter, contact LVSYS support at help@lvsys.com for troubleshooting help.